. 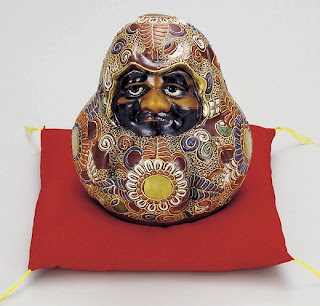 Ishikawa Folk Art - 石川県 . 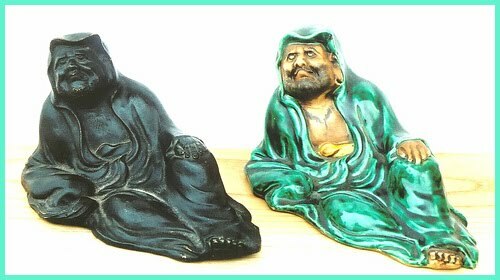 I have written various articles about this type of pottery. 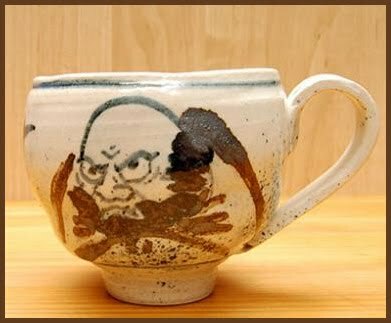 Kutani ware is pottery for everyday life and for the tea ceremony, made in the Kaga Province (now Ishikawa Prefecture). The tradition started in the late 17th century. 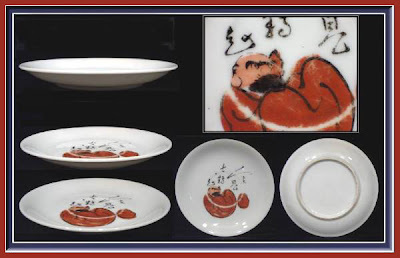 The Old Kutani (kokutani 古九谷) ware has a dark restrained overglaze enamel and dishes and bowls were most common. Other colors are a dull white glaze or a shiny indigo tinge to a dark blue. The characteristic colors are dark yellow and green. 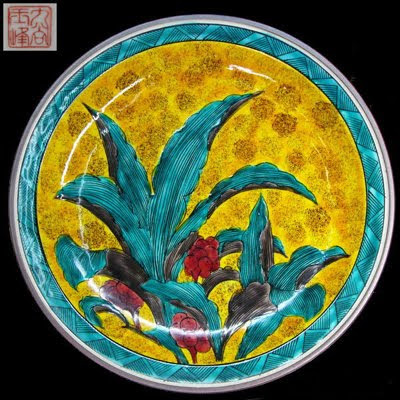 Kutani ware is quite colorful and the designs go back to Chinese porcelains. The Yoshidaya Kiln (吉田家窯1823 - 31) revived the tradition of Old Kutani. Look at these two, one from pottery, the dark one from bronze. They are almost identical, and for good reason. First I got the green one, and about a year later, the bronze one. Side by side, they seem like twins. The pottery one was made by a Kutani potter, who's brother was a maker for temple bells. 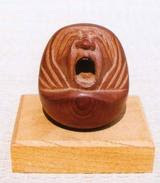 So one day he lent the form to his brother and a few bronze Daruma were made. One of them had found its twin here in my Daruma museum ! This is one of the joys of a collector! 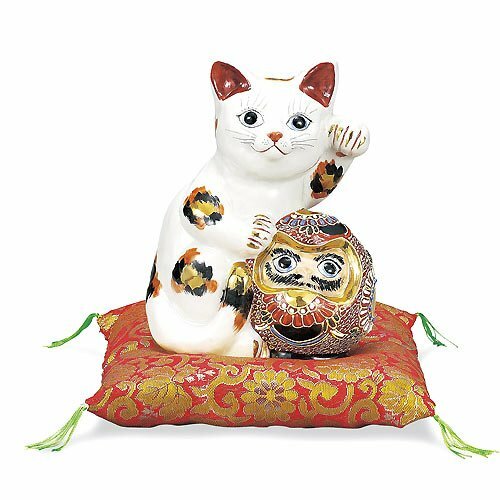 China-making in Kutani dates back around 340 years to the middle of the 17th century. As part of a policy to encourage local industry, a kiln to make colored porcelain was established at Kutani village, when high-quality china clay was discovered there. 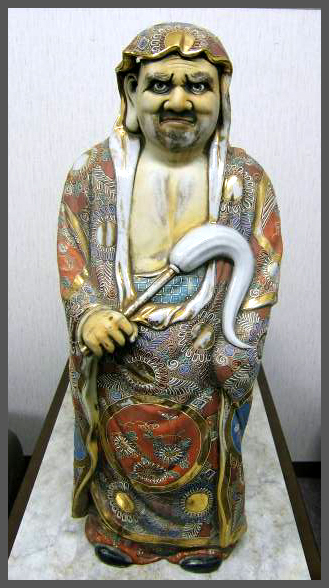 Potters were brought from Hizen (in present-day Saga Prefecture), which was known at the time as a center of porcelain production. This was the beginning of the local manufacture of colored china. The type of pottery was named Kutaniyaki after the village where it began. It had a distinctive style that involved the plentiful use of Kutani gosai, or the five hues of Kutani, including deep blue, purple, yellow, green, and red, which were used to cover the entire surface with colored decoration. Themes included birds and flowers, landscape motifs, and geometrical patterns. In 1710, however, after half a century of continuous production, the kiln was suddenly closed. People have suggested a number of reasons, but nobody really knows why it was closed down. 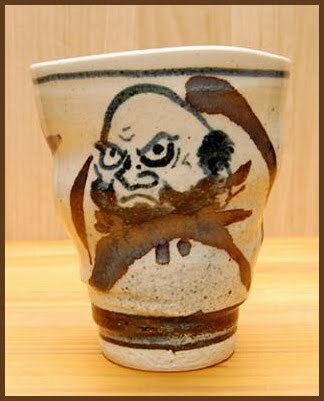 Pottery from this early period is known as Old Kutani, and it forms a separate category from Kutani ware of later years produced after the industry was revived in the 19th century. In the early 19th century, the local ruling clan, which was enjoying power and influence, revived China-making in Kutani. 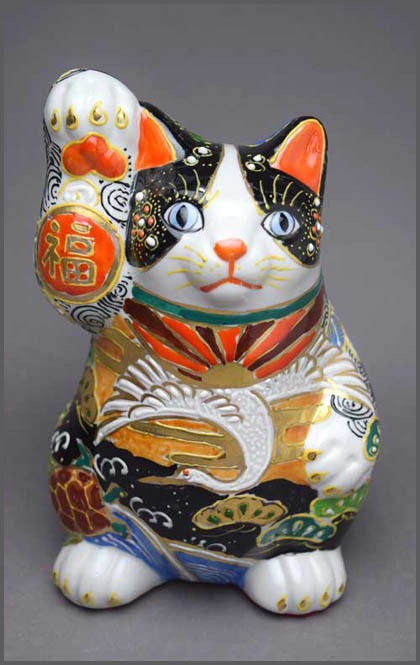 After this, a number of potters and master craftsmen grew up in the area. 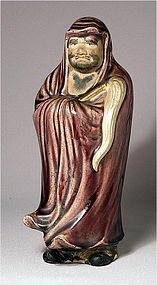 Among them, Shoza Kutani did much to establish the reputation of Kutani ware in the second half of the 19th century. 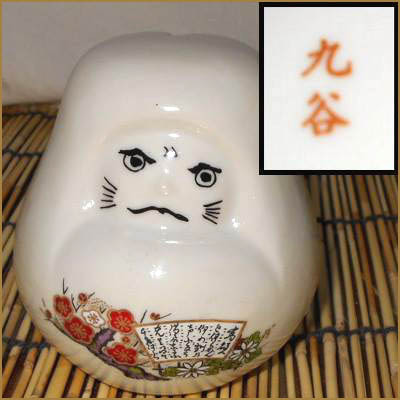 The size of Daruma: 7 1/" High x 3" Dia. 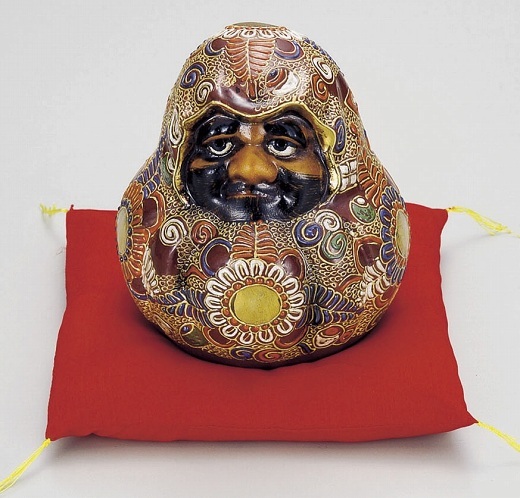 The glazing Daruma has lavender purple which is the color of Kutani used often. I found this piece at Kutani area on my last trip. 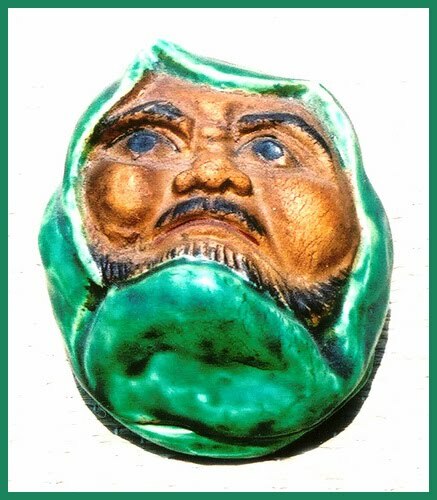 Daruma has merciful expression. 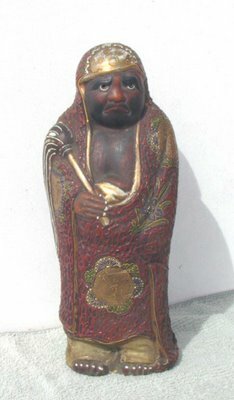 Dating from late Edo, 1860-70. 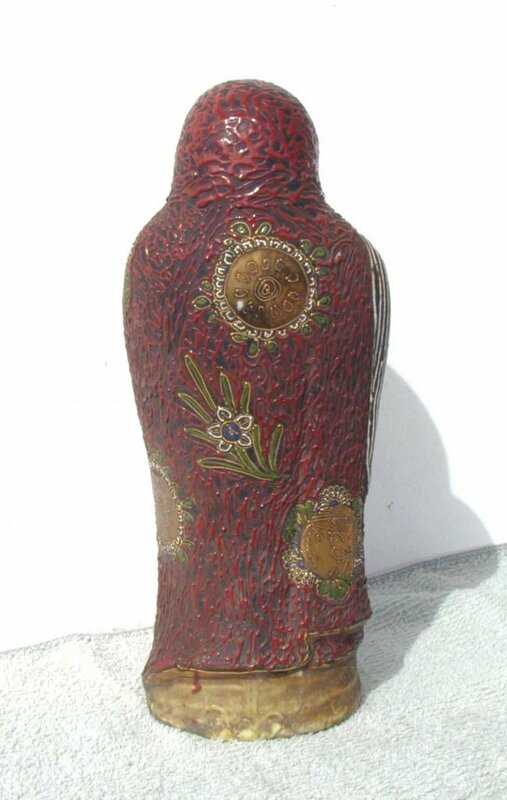 Click for more photos of Kutani pottery !